Galaxy Note 8: How to activate and use Bixby Vision? 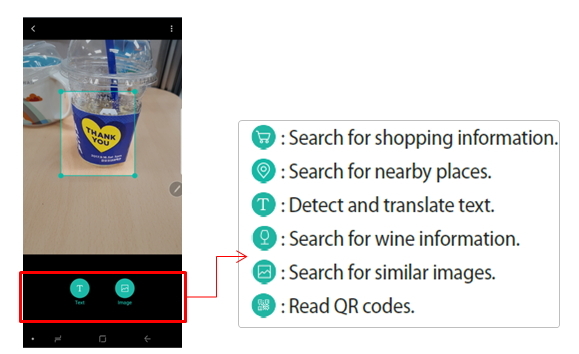 Bixby Vision is an image search feature that scans objects or locations to help you search for products online, nearby places, or similar images. You can also detect text and translate it. • To use this feature, the device must be connected to a Wi-Fi or mobile network. • To use this feature, you must register and sign in to your Samsung account. • Available features may vary depending on the region or service provider. • On the Bixby Home screen, tap. • In the Camera app, tap BIXBY VISION. • In the Gallery app, select an image and tap. • In the Internet app, tap and hold an image and tap Bixby Vision. • Open the Air command panel and tap Bixby Vision. • Open the Air command panel, tap Smart select, select an area, and then tap Bixby Vision. • Capture a screen and select Bixby Vision on the toolbar. 2 When you start Bixby Vision for the first time, you must sign in to your Samsung account. Tap SIGN IN and follow the on-screen instructions. If you are already signed in, this step will not appear. 3 Read and agree to the terms and conditions and tap OK.
4 Please allow the permissions for necessary app to use Bixby Vision. 5 After setup, when a product is recognized and scanned, the available search icons will appear. Point the camera at an object or location, then hold your phone steady while Bixby Vision takes a look. Tap the search icon you want to use. Simple results are shown after choosing a icon. - Searching for shopping information : Recognize products and search for information, such as the product name and its price. A direct link to shopping results is provided to help you purchase a product even when you do not know what it is called. - Searching for nearby places : Search for landmarks or information of places near where the area device scans. - Detecting and translating text : Detect text in an image to share or translate it. - Searching for wine information : Detect the information from a wine label and search for information on the wine. Information, such as its vintage chart, food pairings, and world ranking, will be provided. - Searching for similar images : Search for images similar to the recognized object online. You can view various images with properties similar to the object, such as colour or shape. - Reading QR codes : You can read QR codes to access a variety of information, such as a website’s address, content details, location information, or business card details. Galaxy Note 8: How to clean dirty glass/screen? Galaxy Note 8: How to install the memory card?